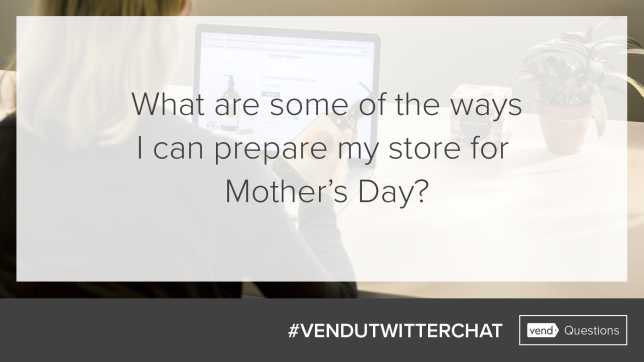 With Mother’s Day coming up for many regions on the 8th of May, Vend U ran their first ever #VendUTwitterChat looking at creative ways retailers could get their stores ready for all those shoppers searching for the perfect gift. It was a jam-packed session full of inventive ideas. So if your store isn’t ready for Mother’s Day yet, here’s what we covered to get you started. See if you can apply any of the ideas below in your store! Q1. What kind of merchandise should I be ordering in-store before Mother’s Day? Our retail expert Francesca Nicasio suggests ordering exclusive, limited mom-centric items. For example, Chantal Guillon in San Francisco has special Mother’s Day Macarons. What limited Mother’s Day items can you offer in your store? If you make your own products, you could create specific flavors or designs especially for mom. Bundles can be a big hit on Mother’s Day too. Consider ordering gift baskets that you can fill with an assortment of items to help pamper mom. Reese Evans, manager of our education content at Vend U shared her top gift-giving ideas, and suggested placing key items at check-out to entice customers to make additional purchases. Gift cards can work perfectly on your countertop as a last-minute purchase by those who are stuck for ideas, and if you want to make the experience as easy as possible for your shoppers consider offering free gift wrapping during non-peak hours. Q2. How can I optimize my store layout to get customers through the door? Jaya Kahlon, store owner of Smoke and Ash recommends starting with an eye-catching window display featuring your most gift-worthy items, and to remind shoppers that Mother’s Day is fast approaching. The more you can make your store stand out, the better. Ensure your marketing has been worth the effort by making the products you’ve promoted easy to find too. Merchandise Mother’s Day items at the front of the store, and use clear signage to communicate any special promotions. Perhaps create a dedicated ‘For Mom’ section within your store! While it’s important to make your Mother’s Day offers easy to find in-store, Francesca suggests that you keep the first few feet of your shop clear. This is known as the ‘decompression zone’ as people shopping in this area are prone to distractions. Q3. 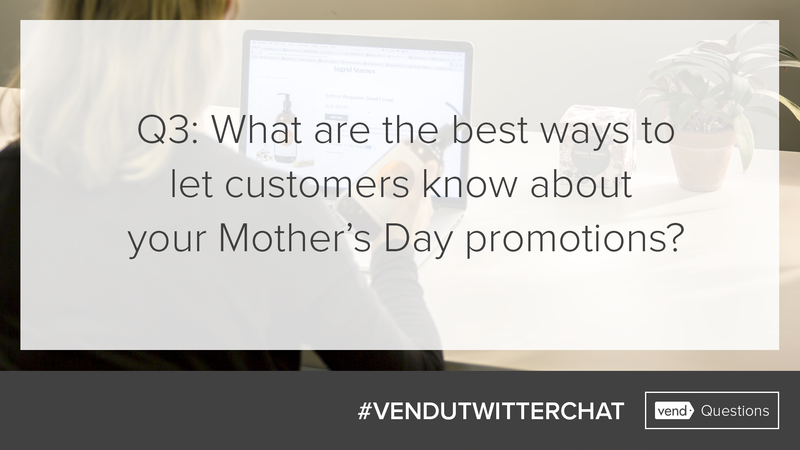 What are the best ways to let customers know about your Mother’s Day promotions? Send out Mother’s Day emails and include gift ideas or a gift guide featuring your exclusive products. And make the online sales process easy for shoppers by providing free or overnight shipping, with a clear communication around cut-off dates. 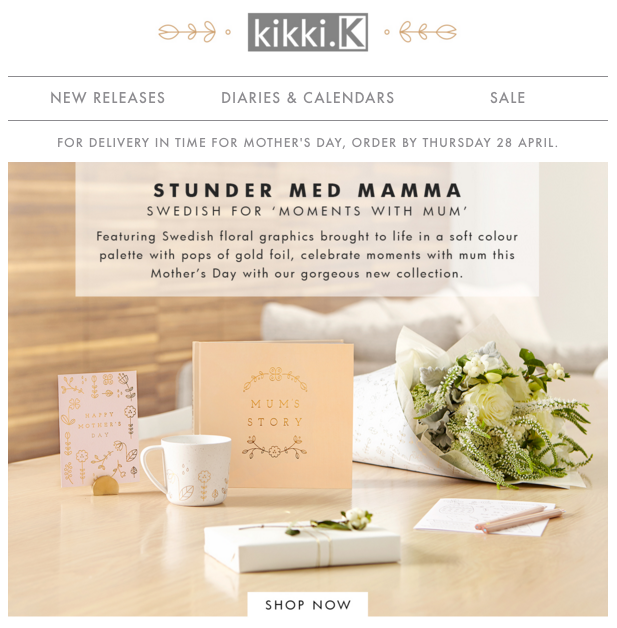 kikki.K Swedish Design sends beautifully photographed emails with clear offers and inspiring gift ideas. Are you running pay-per-click or social media advertisements? Francesca suggests leading people to a specific Mother’s Day landing page instead of a generic webpage, to truly tailor the shopping experience. Don’t forget that people aren’t always shopping for moms on Mother’s Day. Gear your messages towards gifts for dads and children too. Q4. How can I use social media to create excitement around Mother’s Day? Get your messages across early by making your social media cover images mom-centric. You want to stand out from the crowd! Jaya made a great point about avoiding generic phrases like “Treat your mother for Mother’s Day.” Be specific and relate your descriptions back to your products. What will really resonate with your customers to make you stand out as the place to shop for mom? 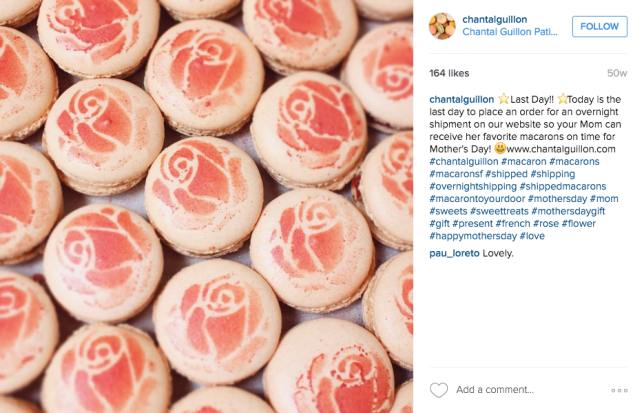 Social media is a great opportunity to get shoppers excited about your exclusive products. You could get creative and make a Mother’s Day Pinterest board containing inspiring messages, gift ideas, or touching images. Or, encourage user-generated content for some interesting mom tales. OFFPRICE Show proposes running a contest! Invite customers to share, comment or tweet their favorite mom stories or photos, and have a special gift for the winner and their mom. Q5. What events can I plan to show appreciation for mothers during the Mother’s Day season? If you’re looking to plan an event, think of events or offers that are all about pampering mom. Spa days, personal shopping experiences, or mani-pedis are great examples. Jessica Ramirez recommends collaborating with someone who can amplify your event and welcome new footfall to your store. Partner with local businesses such as flower shops, spas, or bakeries to run a cross-promo event for Mother’s Day. You might want to offer an exclusive discount, free gift-wrapping, or a complimentary gift with purchase at your event as well. And don’t forget about those who may not be able to celebrate Mother’s Day. Consider helping out a charity this year, your shoppers will love you for it and feel like they’re doing something good too. Vend U is our free education portal that provides world-class retail training to help you get the most out of Vend. With retail eBooks, guides, live events, webinars, and training, they’ve got the resources needed to give you the competitive edge. Find out more. Have you come across any great Mother’s Day activities? What is your store doing for Mother’s Day? Share your ideas and experiences below. The post Preparing for Mother’s Day: Retail insights from the experts appeared first on Vend Retail Blog.